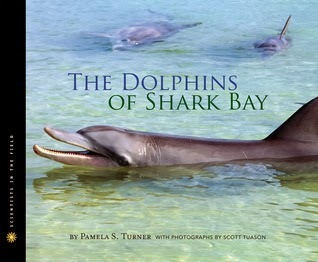 The Dolphins of Shark Bay by Pamela S. Turner, with photographs by Scott Tuason. Grades 4-8. HMH Books for Young Readers, November 2013. 76 pages. Review copy provided by author. All Scientists in the Field books are not created equal. Yes, this is a series we've come to depend on for solid scientific information and stellar back matter. Yes, it's a series that I collect at my library without question. But in terms of readability and kid-appeal, titles vary. And this, my friends, is a surefire hit. Pamela S. Turner, author of The Frog Scientist (another SITF hit for me), accompanies scientists in Australia who are studying a group of dolphins who are really doing something cool. Some of these dolphins have been spotted using tools - collecting sponges from the ocean floor and using them to protect their snouts while rustling up dinner at the sandy, rocky bottom of the bay. Now, maybe it's a little easier to bring the kid-appeal when you're talking about dolphins, animals already well-known and well-loved by children. But author Pamela Turner treats these dolphins as characters in a story, allowing readers to get to know them and their distinct personalities and family structures. While the scientists and their work is certainly central to the book, readers will also come to care about the dolphins of Shark Bay. Outstanding photos give us a closer look at these extraordinary animals using tools, hanging out with their families, frolicking, and so forth. Readers also get a strong conservation message and we learn how tourists feeding the dolphins was actually very harmful to them. This is important information, especially because Shark Bay is a real place with a a dolphinside resort. Of course, this being a Scientists in the Field title, the standard extensive back matter is provided, including additional information about dolphins and further research about dolphins, resources for further study, an update on the dolphin clan, and an index. Happy Nonfiction Monday! You can find this week's roundup at NC Teacher Stuff, so please click through to see what the blogosphere is reading this week!